Note – This recipe does not work as well with gluten free flour blends, at least not so far as I've found. 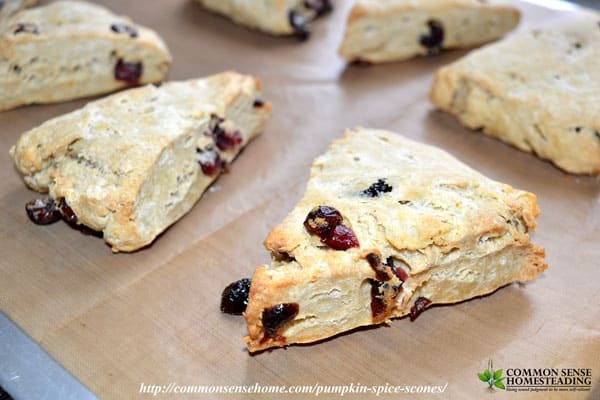 The scones tend to be much heavier, even with careful handling. Note: You may substitute 1 1/2 teaspoons pumpkin spice blend of your choice for the cinnamon, nutmeg, allspice and ginger. Preheat oven to 425 degrees. Prepare baking sheet by greasing well with lard, or lining with parchment paper or reusable parchment paper. In a medium bowl, sift together flours, baking powder, salt, and spices. 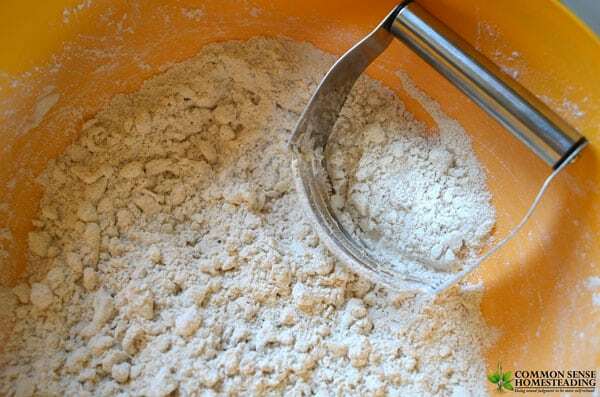 Cut butter into flour using a pastry blender or two butter knives, until it resembles a course meal with chunks of butter no larger than pea sized. Add raisins or dried cranberries if you are using them. Place bowl in fridge or freezer while you prepare the liquids. In a separate bowl, combine pumpkin, heavy cream, brown sugar, and vanilla. Combine liquids mixture with flour mixture. Stir with a wooden spoon until just blended – don't overwork the dough. Treat these like biscuits, not bread. Finish kneading with your hands until mixture forms a ball. If you feel your dough is getting warm at this point, you may want to stick it in the fridge or freezer for 10-15 minutes to make it easier to shape the scones. Shape the dough out into a rough circle, 3/4 to 1 inch thick. Cut it like a pie into 8 pieces. I like to use my scraper/chopper for cutting dough, because I find it easier to give a big, even slice. The scraper chopper also makes it easy to move the scones to the baking sheet, especially if they do get a little sticky. See the little bits of butter still intact in the dough? That's what you're looking for. Those will melt during baking and give you moisture and little, fluffy air pockets. Place pieces on the baking sheet so that they are not touching with about an inch between them. I like to alternate them top to bottom. Bake scones for about 15 minutes at 425 degrees. They should be light brown on the bottom, the tops will darken as they cool. I prefer so use air bake pans for this type of baking, because they are more forgiving than standard pans. You're less likely to end up with scorched bottoms. (Who wants a scorched bottom?) Cool on a wire rack. Mix all ingredients together and drizzle over scones. Alternatively, you can make a coconut oil glaze like the one Jenny at Nourished Kitchen used on her sprouted grain doughnuts. 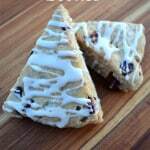 I like to arrange the scones in an alternating pattern and just drizzle across the entire line. The boys are more than happy to clean up any drips. Combine liquids mixture with flour mixture. Stir with a wooden spoon until just blended. Finish kneading with your hands until mixture forms a ball. 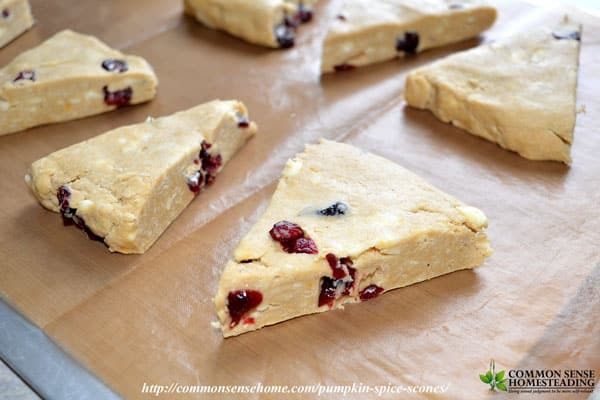 If you feel your dough is getting warm at this point, you may want to stick it in the fridge or freezer for 10-15 minutes to make it easier to shape the scones. 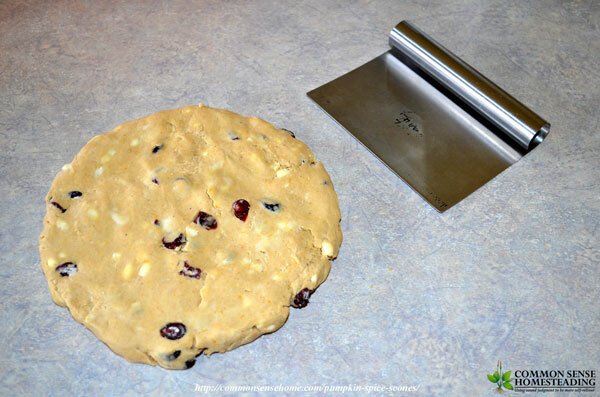 Shape the dough out into a rough circle, 3/4 to 1 inch thick. Cut it like a pie into 8 pieces. Place pieces on the baking sheet so that they are not touching with about an inch between them. 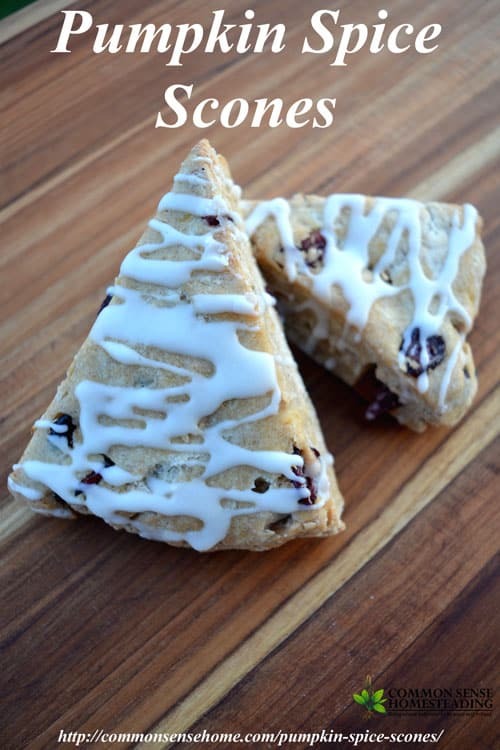 Bake scones for about 15 minutes at 425 degrees. They should be light brown on the bottom, the tops will darken as they cool. Cool on a wire rack. For icing or glaze, mix all ingredients together and drizzle over scones. 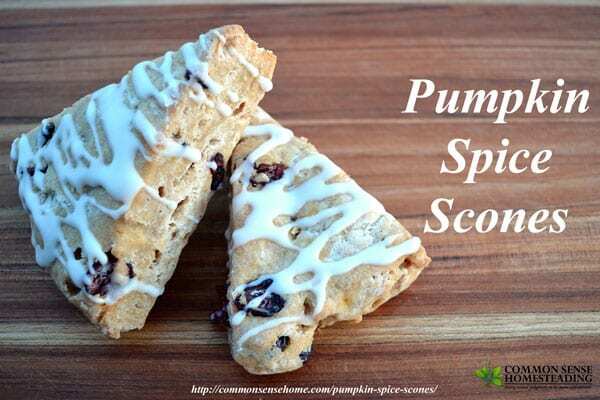 And there you have it – easy spiced pumpkin scones. I like to serve these up with a warm drink like tea or coffee, even eggnog. I hope you give these a try and share the recipe if you've enjoyed it. What are use favorite ways to use pumpkin and squash? Thank you once more for beaut sounding recipes BUT I loved your meeting with the butterfly – thank you for sharing, I could just imagine it. Glad you are still getting these beautiful creatures to visit. I thought they were endangered. Its a lovely spring day here in Melbourne hope your day is great too. You’re very welcome. Monarch numbers are down, but this year was better than last. We have excellent habitat for them – lots of milkweed, plus a variety of wildflowers that bloom throughout the season. One thing I found somewhat troubling was the lack of larva that I saw on the milkweed. They must have been somewhere, but I would have thought they would be easier to find. No, I haven’t tried it. If you made smaller rounds, I’d make less thick so they cook evenly. Then I’d probably cut the baking time by 5 to 10 minutes.